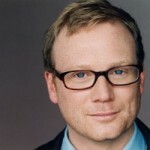 We all know that Andy Daly is one of the best actors, comedians, and foot care specialists in the business. What you might not know: He’s fought a robot, he can seduce his way out of prison, and he is leading a protest against Bridesmaids. Learn about the movie and iTunes UK Singles charts and join us in a rousing game of Chart Darts. Well, my work here is done!